Research cameras pointed at glaciers are inevitably bearers of depressing news, tracking the crumble of ice rotting over the years. Yet soft moonlight and misty mountains framing blue ice transform this datapoint into a moment of pure beauty. 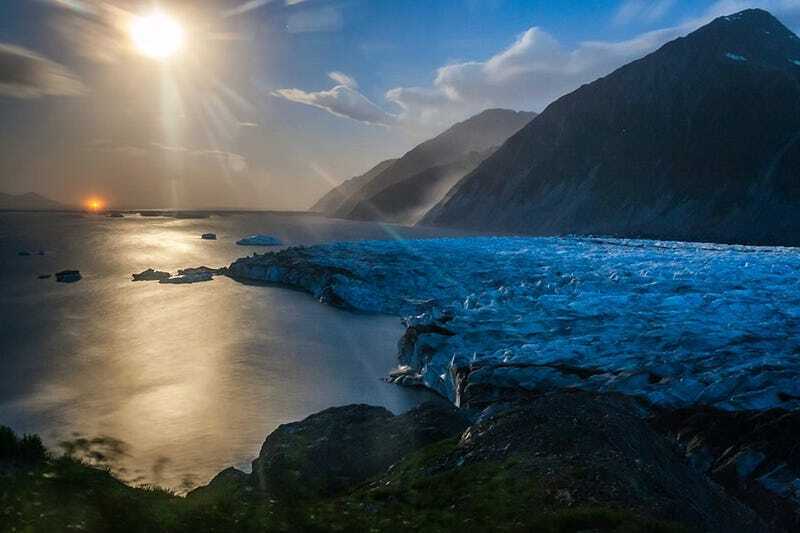 About 51% of Kenai Fjords National Park in Alaska is covered in ice, and the rest bares the scars of past glaciation. This camera was set up for five weeks in summer 2015 as a test run on monitoring glacial activity. It collected time-lapse imagery of the terminus of Bear Glacier, hoping to spot any large calvings of blocks of ice into the fjord, or outburst floods. Unfortunately for the researchers, they didn’t catch any activity during the short span the camera was out, but we still win with this truly lovely scenic shot. Thank you to Kenai Fjords National Park Physical Science Program Manager Deb Kurtz for additional details!